You are on Guernsey Airport Information. Skip to the next section. 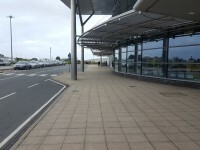 For more information about the parking, shops, eateries, toilet facilities and access around the airport please visit the main access guide for Guernsey Airport. 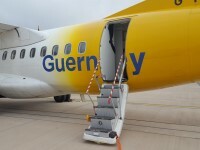 To view the Guernsey Airport access guide please click here (opens in a new tab). You are on Aircraft to Arrivals Gate to Baggage Reclaim. Skip to the next section. 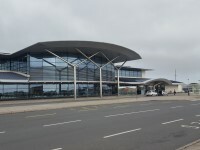 After the aircraft lands at Guernsey Airport a member of staff can provide assistance helping passengers disembark the aircraft. 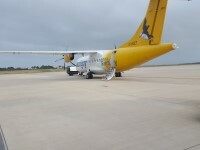 There is a stair climber available for the propeller planes or there is an ambulift available for jet engine planes. 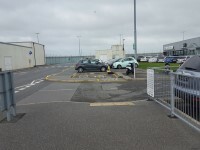 There is step free access from the aircraft to the arrivals gates. 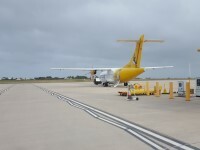 The surface of the apron is concrete. 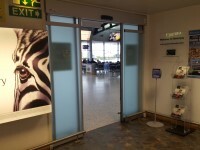 The arrivals gates are automatic doors, which are 150cm wide. 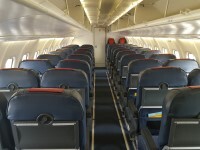 The doors are held open whilst passengers are disembarking. 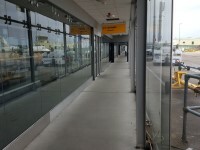 There is a covered walkway leading from the arrivals gates to the entrance leading to baggage reclaim. The surface of the walkway is concrete. 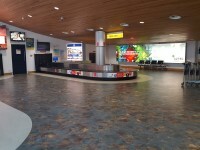 The distance from to baggage reclaim will vary depending on which arrivals gate passengers enter from. You are on Baggage Reclaim to Main Concourse to Arrivals Entrance. Skip to the next section. 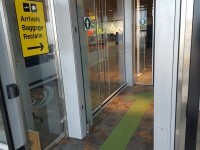 There are two sets of automatic doors leading into the baggage reclaim area. 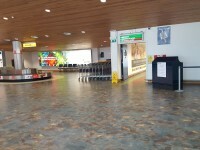 Upon entering the baggage reclaim area, the baggage reclaim belts are located to the left and the accessible and standard toilets are located to the right. A member of staff can provide assistance with collecting baggage from the reclaim belt. After collecting the baggage there is step free access leading to the entrance into the main concourse. 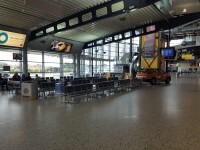 There are automatic doors leading from the baggage reclaim to the main concourse. 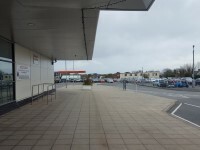 After entering the main concourse there is step free access leading to the arrivals entrance. You are on Arrivals Entrance to Main Car Park. Skip to the next section. After exiting the airport from the Arrivals Entrance passengers turn right and follow the path for approximately 30m to the crossing point. 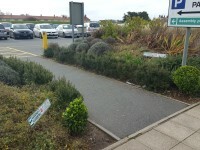 The surface of the path is block paving. 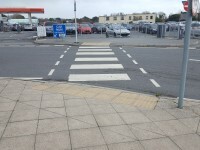 There is crossing point with dropped kerbs at either side. 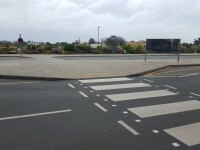 After completing the crossing passengers turn right and follow the path for approximately 45m to the main car park. You are on Arrivals Entrance to Overflow Car Park. Skip to the next section. After exiting the airport from the Arrivals Entrance passengers turn left and follow the path for approximately 45m to the crossing point. 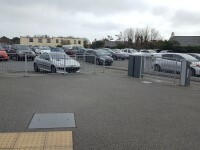 After completing the crossing passengers go straight ahead and follow the path for approximately 5m to the overflow car park. You are on Arrivals Entrance to Bus Stop and Taxi Rank. Skip to the next section. 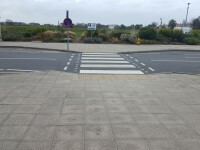 After completing the crossing passengers turn left and follow the path to the bus stop and taxi ranks. 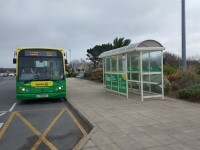 For more information about the bus from Guernsey Airport to St Peter Port please click here (opens in a new tab). 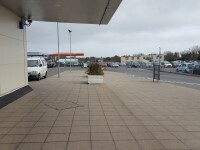 You are on Arrivals Entrance to Car Hire Vehicle Collection. Skip to the next section. 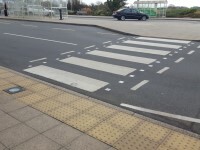 After completing the crossing passengers turn left and follow the path for approximately 2m to the another crossing point with tactile paving on both sides. 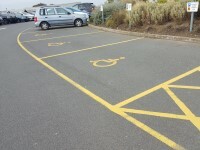 The crossing point leads to the car hire collection area.